Carl Nielsen (1865-1931) is world famous for his six symphonies and his two operas Saul and David and Maskerade. In addition he wrote programme music and incidental music for the theatre, thereby creating some of his most popular works. This release features some of his finest pieces for orchestra, displaying the composer's sharp sense of the refined, playful and humorous. "Ligesom i forspillet og den kække 'Hanedans' fra 'Maskerade' behandler Thomas Dausgaard musikken klart og muskuløst. Det er energiske fortolkninger med minimale mængder af lommeuld"
EDITOR'S CHOICE - "This is outstanding..."
Cockerel's Dance 5:42 9,60 kr. Prelude: Andantino giusto 5:38 9,60 kr. I Prelude 2:15 6,40 kr. II Andante quasi sostenuto 2:43 6,40 kr. III Postlude: Allegro non troppo 2:03 6,40 kr. IV Snefrid's Sleep: Andante - Quasi allegretto - Andante 3:27 6,40 kr. V Funeral Music: Andante sostenuto 2:33 6,40 kr. Prelude to Act II: Allegro marziale 5:08 9,60 kr. Andante sostenuto - Andante tranquillo - Allegro molto 10:17 12,80 kr. Prelude to Act III: Andantino espressivo 2:11 6,40 kr. Andante tranquillo 8:43 9,60 kr. Ouverture: Allegretto con brio 5:22 9,60 kr. Andante tranquillo - Allegro ma non troppo - Presto - Tempo I - Andante tranquillo 11:55 12,80 kr. Carl Nielsen (1865-1931) is known internationally for his six symphonies. In Denmark his name is further associated with the large number of popular songs and melodies that flowed out to the Danes from his pen throughout most of his life, so that almost every Dane knows a song by Carl Nielsen. But while he lived his everyday musical life was rooted in yet another context: the world of the theatre, and especially that of the Royal Danish Theatre in Copenhagen. From 1889 until 1905 he was employed as a violinist in the Royal Danish Orchestra - the house orchestra of the national theatre. Even at that time he took on occasional conducting tasks, and in the years from 1908 until 1914 he was a regular conductor at the Royal Theatre. The atmosphere surrounding his activities as a conductor was never completely calm, and several times he went through stormy periods at the theatre, often with much discussion of his activities in the press. He resigned in 1914, but continued to write stage music. Besides his two operas Saul and David (1898-1901) and Masquerade (1905-06), he wrote music for many plays. This was partly because in Copenhagen, until just two years ago, opera and drama belonged in the same theatre and were played on the same stages. It was thus very reasonable to use the large house orchestra for performances of plays. Masquerade is viewed by many people as the Danish national opera. The libretto was written by the Danish literary scholar Vilhelm Andersen after a comedy by Ludvig Holberg from the eighteenth century. Holberg played - and still plays - a quite central role as a Danish writer of comedies; his statue stands in front of the Royal Theatre. many people thought that it was blasphemy to turn one of his texts into an opera. But the many red lights and full houses after the premiere said something quite different. With this work Carl Nielsen's music began in earnest to reach out to the general public. Most of Masquerade was composed in 1905 - in a strange fit of inspiration, a state of weightlessness at which even Carl Nielsen himself expressed surprise many times later. Presumably this came from Vilhelm Andersen's emphasis on the Dionysian aspect in Holberg. The overture was finished in 22 days, just before the premiere in 1906. At the same time it was a Mozart year - the 150th anniversary of the birth of the master. So the same year Carl Nielsen wrote a significant and later very well-known essay on Mozart, in which he put Mozart before Beethoven, who had otherwise been the great composer-hero of the nineteenth century. This too rubbed off on Masquerade, which takes place in 18th-century Copenhagen. Or it may be that Carl Nielsen's musical experience with the opera gave him a new view of Mozart. In the international perspective, one can say that with his work Carl Nielsen truly latched on to a particular Classicist current amidst the widespread Late Romantic attitudes in European music at the turn of the century. Music full of sophistication, playfulness, the sheer joy of music-making, acuity, humour and pointedness had already begun to emerge at the end of the century, and made its mark even more clearly over the next few years. Typically this new - or young\\ Classicism (Busoni's expression) - had its breakthrough in one-movement works, opera overtures or symphonic poems. One thinks of characteristic individual works like Nikolaus von Reznicek's overture to Donna Anna (1894) or, after Masquerade, Ermanno Wolf-Ferrari's overture to Il segreto di Susanna (1909). One thinks of Busoni's comic operas after 1910; and of course - first and foremost - of Richard Strauss, not only Der Rosenkavalier from 1910, but also his witty, sophisticated and shrewd points in some of the early symphonic poems. In one fell swoop Carl Nielsen's overture to Masquerade has to open the door to great festivity and high comedy. In the fast movement it has both animated narrative and playful counterpoint, expressing a unity of endless energy and great lightness in the Dionysian rebirth of the century of Enlightenment. The Dance of the Cockerels from Masquerade is one of Carl Nielsen's most popular pieces. It belongs to Act Three of the opera, the festivities at the big masked ball which brings all the participants together, high and low, young and old. The dance is in 3/4 time - not like a waltz, perhaps rather like a Polonaise. We hear the proud cockerel strutting around among the clucking hens. In the trio comes an eruptive, stereophonic episode where trumpets, bassoons, flutes and horns cry out to one another - like young cockerels squabbling over the hens. In the next work, Snefrid, we are back among Carl Nielsen's earliest works. True, in 1889 he had written a couple of pieces for a production at the Dagmar Theatre, but -Snefrid was still to become his first true -theatre music that could also be performed in concerts. The work was written in 1893, just after Carl Nielsen's Symphony No. 1 from the previous year. He had so to speak just made his entry on the stage as a composer, achieved his breakthrough, and was only now finding his own style. For that reason there is a kind of lustre of originality over the pieces from Snefrid, especially in the slow -lyrical passages. Of the third of the pieces, the love music, Carl Nielsen wrote in a letter that he had played it for an acquaintance: \\he simply blushed at the sensual character of the music ...\\ However, we can also find words from the up-and-coming young composer saying quite the opposite: he claimed that the high, great music he wanted to write would be the opposite of sensuality. Snefrid is thus the expression of a duality in the period. On the one hand it reached outwards towards the sensual, on the other it aspires upwards towards the high ideals. Once more this matches the attitudes of the contemporary Symbolist poets. The prelude to Snefrid in a piano arrangement was in fact printed in a contemporary literary periodical called Ungt Blod (‘Young Blood'). 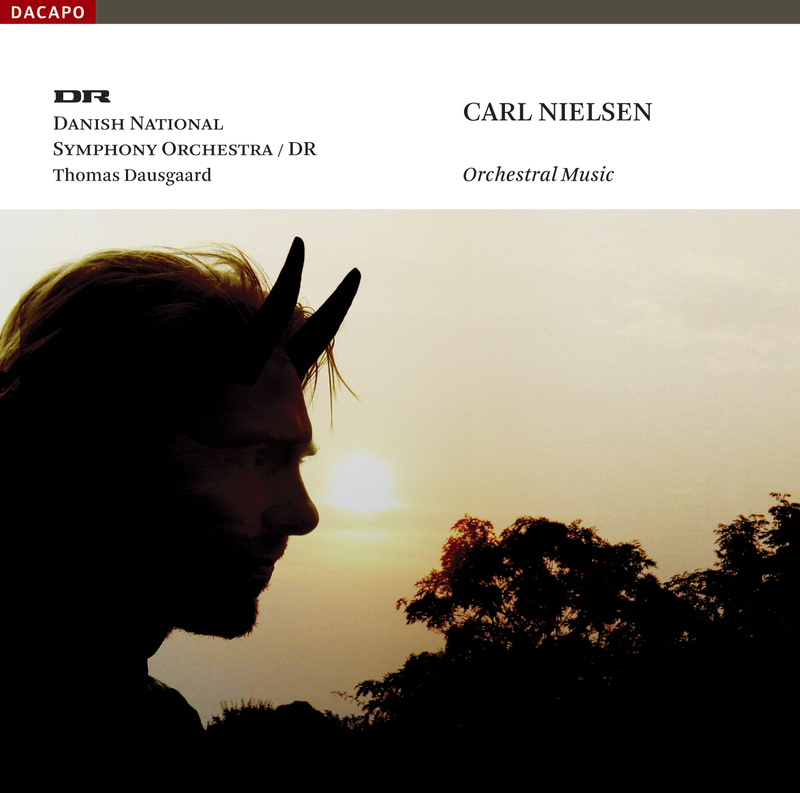 Carl Nielsen's first opera Saul and David has no overture, but it does have an independent prelude to Act Two. The opera combines an intense psychological portrait of the vacillating Saul with a more oratorio-like monumental style. The prelude to Act Two precedes a scene in the King's hall where David plays for Saul, and where a messenger brings the news of the great giant of the Philistines, Goliath. The prelude announces a world of both internal and external -struggle. The brisk, piercing dissonance for three trumpets attracted attention at the time and was discussed in most of the reviews. It is based on a linear principle on the first three notes, where two thirds that lead to a horn fifth in the second and third trumpet are combined with a simple ascending melody in the first trumpet. The prelude was performed separately before the premiere of the opera, conducted by Johan Svendsen, who was a warm supporter of the work. At the premiere of the whole opera Carl Nielsen himself conducted. With the work Rhapsodic Overture. A Fantasy Journey to the Faroe Islands, we are near the end of Carl Nielsen's life, after the completion of the sixth and last symphony. It is an occasional composition written for a celebration at the Royal Theatre to mark a visit from the Faroe Islands. We hear how the music approaches the remote islands in the Atlantic and arrives at an old melody well known in Denmark as Påskeklokken kimed mildt (‘Gently chimed the Easter bell'). The work is also an example of how Carl Nielsen in his later years touched on many widely differing landscapes, each of which required its own music. In 1908, a few years after Masquerade, the play Willemoes was written to commemorate the centenary of the death of the Danish naval hero Peter Willemoes at the Battle of Zealand Point. The text was by L.C. Nielsen, with whom Carl Nielsen collaborated several times. One of the melodies that appeared in the play later became a Folk High School song, Havet omkring Danmark (‘The Sea around Denmark'). Carl Nielsen shared the composition of the music with his pupil Emilius Bangert. The only orchestral piece composed solely by Carl Nielsen in the play is the prelude to Act Three. It is meant to refer to Willemoes' love for a young girl at Tranekær on Langeland, the island which has also, because of Grundtvig's intense youthful love affair there, assumed a special position in the history of Denmark during the Napoleonic Wars. The orchestral piece Pan and Syrinx from 1917-18 is one of Carl Nielsen's most distinctive works, and has always been so regarded. Among other things that have been pointed out is a surprising affinity with musical Impressionism - even with Debussy's well known piece for solo flute, Syrinx, written five years previously, although Carl Nielsen is unlikely to have known it. But that is only one side of the work. The other is the odd shifts in tempo and the special alternation between transparent chamber-musical passages and tutti sections. Here, for the first time, Carl Nielsen uses a relatively large array of exotic percussion; in the work he is stepping out on new paths after the conclusion of his Symphony no. 4. The work points forward all the way to works of the 1920s, especially the Flute Concerto of 1926. The story of Pan and Syrinx comes from Ovid's Metamorphoses. Pan is attracted to the nymph Syrinx. He pursues her, dancing and bleating. But she is frightened and flees to a woodland lake, where she is transformed into a reed. That is a summary of what Carl Nielsen writes as a text in the score. But he must also have been thinking about the continuation in Ovid, where Pan makes a flute from the reeds, so that he is united with Syrinx through his art. At the end of the piece the high strings lie close to one another in a dissonant block of sound. The individual strings must then gradually stop playing with vibrato. The result is a static sound where the reeds become an instrument, the nymph becomes a thing, and love becomes art. When Carl Nielsen was making up his mind at the age of 18 to leave his position as a regimental band musician in Odense to go to Copenhagen, he spoke to his mother. She referred to Hans Christian Andersen, who had also come from Funen to Copenhagen and later became world-famous. Carl too could do that. Towards the end of Carl Nielsen's life the paths of the two Funen men were to cross in the overture to Cupid and the Poet. The play, celebrating the 125th anniversary of the birth of Hans Christian Andersen, was written by Sophus Michaëlis. Carl Nielsen himself was satisfied with his work: he wrote to his wife that one should never relax when one had to write occasional or commissioned music. Of Hans Christian Andersen he said that when he thought of Andersen's tales, it evoked associations of a futuristic - perhaps, to use a later word, surrealistic - painting: \\... an old fir tree, a spinning top, yes and the neck of a swan\\. In this piece Carl Nielsen is quite in tune with the situation around 1930 and with his own Symphonies 5 and 6. Sophus Michaëlis' Hans Christian Andersen Gala Play had its premiere on 12th August at the Odense Theatre. Carl Nielsen himself conducted, there in the region of his childhood. The original piece became Carl Nielsen's last orchestral composition. In the large-scale overture Helios from 1902 we find ourselves at the beginning of Carl Nielsen's great musical ‘sunshine period', which culminated in Symphony No. 3, nine years later. If Nielsen chose the Greek word for the sun, it was because the work was written in Greece, and at that time European culture had once more rediscovered ancient Hellas, as expressed for example by the resumption of the Olympic Games of antiquity. Carl Nielsen (1865-1931) wurde mit seinen sechs Sinfonien international bekannt. In Dänemark verknüpfen sich mit seinem Namen außerdem die unzähligen volkstümlichen Lieder und Melodien, die er den größten Teil seines Lebens über das Land hinströmen ließ, sodass fast jeder Däne ein Lied von Carl Nielsen kennt. Zu seinen Lebzeiten war sein musika-lischer Alltag noch in einem dritten Zu-sam-men-hang verankert, nämlich in der Welt des Theaters und hier namentlich im Königlichen Theater von Kopenhagen. Von 1889 bis 1905 war er als Violinist im Orchester der Nationalszene, der Königlichen Kapelle, tätig. Bereits zu der Zeit wurden ihm zwischendurch auch schon Dirigentenaufgaben übertragen. In den Jahren 1908 bis 1914 war er dann Kapellmeister am Königlichen Theater. Um seine Dirigententätigkeit wurde es nie still, zuweilen ging es am Königlichen Theater stürmisch zu, wobei sein Wirken in der Presse heftig diskutiert wurde. So verließ er 1914 das Theater, schrieb aber weiterhin Theatermusik. Außer seinen beiden Opern Saul og David (1898-1901) und Maskarade (1905-06) komponierte er auch Musik zu vielen Schauspielen, was auch damit zu tun hatte, dass Schauspiel und Oper in Kopenhagen noch bis vor zwei Jahren zum selben Theater gehörten und auf den gleichen Bühnen gegeben wurden. Es lag deshalb sehr nahe, das große Orchester des Hauses auch für Schauspielaufführungen einzusetzen. Maskarade gilt vielen als die dänische Nationaloper. Das Libretto schrieb der dänische Literaturwissenschaftler Vilhelm Andersen nach einer aus dem 18. Jahrhundert stammenden Komödie von Ludvig Holberg. Holbergs Stellung als dänischer Komödiendichter war und ist immer noch unangefochten. Sein Standbild steht vor dem Theater. Viele meinten, seine Texte in eine Oper umzusetzen, sei ein Sakrileg. Doch die roten Lichter und das voll besetzte Haus nach der Uraufführung sprachen eine ganz andere Sprache. Mit diesem Werk erreichte Nielsens Musik allmählich wirklich das breite Publikum. Der größte Teil von Maskarade wurde 1905 komponiert, in einem sonderbaren Inspirationsrausch, einem schwerelosen Zustand, über den sich Nielsen später selbst vielfach wundern konnte. Vermutlich kam das daher, dass Andersen das Dionysische bei Holberg betont hatte. Die Ouvertüre wurde direkt vor der Premiere im Jahr 1906 in zweiundzwanzig Tagen beendet. Das war zugleich ein Mozartjahr, nämlich das 150. Geburtsjahr des Meisters, weshalb Nielsen in jenem Jahr auch einen bedeutenden und später sehr bekannten Mozartessay schrieb, in dem er Mozart über Beethoven stellte, der im 19. Jahrhundert eigentlich als der große Komponistenheld galt. Auch das hat auf die im Kopenhagen des 18. Jahrhunderts spielende Maskarade abgefärbt. Es mag aber auch sein, dass die musikalischen Erfahrungen, die Nielsen mit der Oper machte, seine Auffassung von Mozart veränderten. International gesehen koppelte sich Nielsen mit seinem Werk wohl wirklich an eine besondere klassizistische Strömung, die die ansonsten spätromantische Haltung in der europäischen Musik der Jahrhundertwende durchzog. Es handelte sich dabei um eine raffinierte, spielerische, musizierende, scharfe, humoristische und pointenreiche Musik, die sich bereits gegen Ende des Jahrhunderts Bahn brach und sich in den folgenden Jahren noch deutlicher profilierte. Dieser neue - oder „junge\\ (ein Ausdruck von Busoni) - Klassizität setzte sich typisch in einsätzigen Werken, in Opernouvertüren oder sinfonischen Dichtungen durch. Man denkt dabei an charakteristische Einzelwerke wie Nikolaus von Rezniceks Ouvertüre zu Donna Anna (1894) oder, nach der Maskarade, Ermanno Wolf-Ferraris Ouvertüre zu Susannens Geheimnis (1909), aber auch an Busonis komische Opern nach 1910 und natürlich in erster Linie an Richard Strauss, und zwar nicht nur an den Rosenkavalier von 1910, sondern auch an seine witzigen, modernen und scharfen Pointen in einigen der frühen sinfonischen Dichtungen. Nielsens Ouvertüre zu Maskarade soll den Vorhang mit einem Schlag zum großen Fest und zur hohen Komik aufgehen lassen. Der schnelle Satz hat etwas eifrig Erzählendes und zeigt zugleich eine spielerische Kontrapunktik, Ausdruck der Einheit der unendlichen Energie und der großen Leichtigkeit in der dionysischen Wiedergeburt des Jahrhunderts der Aufklärung. Der Hahnentanz aus der Maskarade zählt zu Nielsens beliebtesten Stücken. Er gehört in den dritten Akt der Oper, zum Fest der großen Maskerade, das alle Mitwirkenden, Hoch und Niedrig, Jung und Alt, vereinen soll. Der Tanz ist im -Takt gehalten, nicht als Walzer, vielleicht eher als Polonaise. Man hört den stolzen Hahn, der unter den gackernden Hühnern umherstolziert. Im Trio kommt eine ausbruchhafte, stereofonische Episode, in der sich Trompeten, Fagotte, Flöten und Hörner anschreien. Wie Hähnchen, die sich um das Huhn zanken. In dem folgenden Werk Snefrid ist man bei Nielsens frühesten Werken. Er hatte zwar schon 1889 für eine Vorstellung im Dagmartheater ein paar Sätze geschrieben, doch Snefrid sollte dennoch seine erste eigentliche Theatermusik sein, die auch im Konzertsaal aufgeführt werden konnte. Das Werk wurde 1893 komponiert, gleich nach Nielsens Sinfonie Nr. 1 aus dem Vorjahr. Der Komponist hat die Bühne sozusagen gerade erst betreten, hat sich soeben erst durchgesetzt und gerade seinen eigenen Stil gefunden. Deshalb liegt auf den Stücken aus Snefrid, vor allem in den langsamen, lyrischen Passagen, eine Art Ursprünglichkeitsglanz. Vom dritten Stück, der Liebesmusik, schrieb Nielsen in einem Brief, er habe es einem Bekannten vorgespielt: „Der sinnliche Charakter der Musik trieb ihm die Röte ins Gesicht ...\\ Gleichzeitig findet man jedoch völlig entgegengesetzte Worte des jungen, aufstrebenden Komponisten. Er behauptete, die hohe große Musik, die er schreiben wolle, solle das Gegenteil von Sinnlichkeit beinhalten. Snefrid ist somit Ausdruck einer Spaltung der Zeit. Einerseits strebt die Musik zum Sinnlichen, andererseits zu den hohen Idealen. Das wiederum entsprach der Haltung der zeitgenössischen symbolistischen Dichter. Das Vorspiel zu Snefrid erschien denn auch als Klavierauszug in der zeitgenössischen literarischen Zeitschrift „Ungt Blod\\ (Junges Blut). Nielsens erste Oper Saul og David hat keine Ouvertüre, dafür aber ein selbständiges Vorspiel zum zweiten Akt. Die Oper verbindet eine starke psychologische Schilderung des wankelmütigen Saul mit einem stärker oratorienhaften Monumentalstil. Das Vorspiel zum zweiten Akt geht einer Szene in der Halle des Königs voraus, in der David vor Saul spielt und ein Bote von Goliath, dem großen Riesen der Philister, berichtet. Das Vorspiel erschließt eine Welt mit inneren und äußeren Kämpfen. Die frische schneidende Dissonanz für drei Trompeter erregte großes Aufsehen und wurde in den meisten Kritiken diskutiert. Sie beruht auf einem linearen Prinzip in den ersten drei Tönen, bei dem zwei zu einer Hornquinte in der 2. und 3. Trompete hinführende Terzen mit einer aufsteigenden einfachen Melodie der 1. Trompete verbunden werden. Das Vorspiel wurde noch vor der Uraufführung der Oper gesondert gespielt, und zwar unter der Leitung von Johan Svendsen, der sich für das Werk stark machte. Die Uraufführung der gesamten Oper dirigierte Nielsen selbst. Mit dem Werk Rapsodisk ouverture. En fantasirejse til Færøerne nähert man sich dem Ende von Carl Nielsens Leben, der die sechste und letzte Sinfonie abgeschlossen hat. Es handelt sich bei dem Werk um eine Gelegenheitskomposition für ein Fest am Königlichen Theater aus Anlass eines Besuches von den Färöer Inseln. Man erlebt mit, wie sich die Musik den fernen Inseln im Atlantik nähert, und gelangt zu einer alten, bekannten Melodie, die in Dänemark Påskeklokken kimed mildt (Die Osterglocke läutet sanft) heißt. Das Werk ist auch ein Beispiel dafür, dass sich Nielsen in seinen späteren Jahren vielen ganz unterschiedlichen Landschaften näherte, die jeweils ihre eigene Musik erforderten. Das Schauspiel Willemoes sollte 1908, zwei Jahre nach der Maskarade, den dänischen Seehelden Peter Willemoes feiern, der hundert Jahre zuvor in einer Schlacht bei Sjællands Odde gefallen war. Der Text stammte von L.C. Nielsen, mit dem Carl Nielsen mehrere Male zusammenarbeitete. In dem Stück kommt eine Melodie vor, aus der später das in den Heimvolkshochschulen gesungene Lied Havet omkring Danmark (Das Meer um Dänemark) wurde. Nielsen teilte sich die Komposition der Musik mit seinem Schüler Emilius Bangert. Das einzige ausschließlich von Nielsen geschriebene Orchesterstück des Schauspiels ist das Vorspiel zum dritten Akt, das darauf hinweisen soll, dass sich Willemoes in ein junges Mädchen von Tranekær auf der Insel Langeland verliebt hatte, der Insel, die auch wegen Grundtvigs heftiger Jugendliebe in der dänischen Geschichte der englischen Kriege einen besonderen Platz einnimmt. Das 1917-18 entstandene Orchesterstück Pan og Syrinx gehört zu Nielsens eigenwil-ligsten Werken und wurde auch immer so gesehen, wobei man u. a. auf eine überraschende Verwandtschaft mit dem musikalischen Impressionismus hingewiesen hat und sogar auf Debussys bekanntes, fünf Jahre zuvor geschriebenes Soloflötenstück Syrinx verweisen kann, auch wenn Nielsen es kaum gekannt haben dürfte. Doch das ist nur die eine Seite des Werkes. Die andere beinhaltet die eigentümlichen Tempiwechsel und das besondere Wechselspiel von kammermusikalischen, durchsichtigen Passagen und Tuttistellen. Nielsen setzt hier erstmals einen verhältnismäßig großen Apparat exotischer Schlagzeuge ein und beschreitet somit nach Beendigung seiner Sinfonie Nr. 4 neue Wege. Das Werk weist schon auf Kompositionen der 20er Jahre voraus, vor allem auf das Flötenkonzert von 1926. Die Geschichte von Pan und Syrinx kann man in Ovids Metamorphosen nachlesen. Sie handelt von Pan, der sich von der Nymphe Syrinx angezogen fühlt und sie mit Tanz und Geblöke verfolgt. Doch sie fürchtet sich und flieht zu einem Waldsee, wo sie in ein Schilfrohr verwandelt wird. Zusammengefasst schreibt Nielsen dies in die Partitur. Er muss jedoch auch an die bei Ovid zu findende Fortsetzung gedacht haben. Dort macht Pan nämlich aus dem Schilf eine Flöte, sodass er durch seine Kunst mit Syrinx vereint wird. Gegen Ende des Stückes liegen die hohen Streicher als dissonierender Klangblock eng beieinander. Die einzelnen Streicher stellen dann allmählich ihr Vibratospiel ein. Es entsteht ein stehender Klang, die Schilfrohre werden zum Instrument, die Nymphe wird zum Ding, die Liebe zur Kunst. Als sich der achtzehnjährige Carl Nielsen entschloss, seine Stelle als Regiments-musiker in Odense aufzugeben und nach Kopenhagen zu gehen, sprach er mit seiner Mutter. Sie verwies auf Hans Christian Andersen, der ebenfalls von Fünen nach Kopenhagen gekommen war und später weltberühmt wurde. Das müsse er auch können. Gegen Ende von Nielsens Leben kreuzten sich dann die Wege der beiden Fünen in der Ouvertüre zu Amor og digteren. Das Schauspiel, mit dem Andersens 125. Geburtstag begangen werden sollte, stammte von Sophus Michaëlis. Nielsen war mit seiner eigenen Arbeit zufrieden, er schrieb an seine Frau, dass man nie entspannen dürfe, wenn man Gelegenheits- oder Auftragsmusik schreibe. Über Andersen sagte er, wenn er an dessen Märchen denke, dann falle ihm ein futuristisches - vielleicht mit einem späteren Wort: „surrealistisches\\ - Gemälde ein: „... eine alte Fichte, ein Kreisel, ja und der Hals eines Schwans.\\ In diesem Stück ist Nielsen ganz auf der Höhe der Lage um 1930 und reicht an seine eigenen Sinfonien Nr. 5 und 6 heran. Das H.C. Andersen-festspil von Sophus Michaëlis wurde am 12. August am Theater von Odense uraufgeführt. Nielsen dirigierte selbst, hier in dem Landesteil seiner Kindheit. Das originelle Stück war Nielsens letzte Orchesterkomposition. In der groß angelegten Helios-ouverture von 1902 befindet man sich zu Beginn der großen musikalischen Sonnenzeit von Nielsen, die neun Jahre später in der Sinfonie Nr. 3 gipfelte. Nielsen wählte das griechische Wort für Sonne, weil das Werk in Griechenland geschrieben wurde, aber auch, weil die europäische Kultur zu der Zeit noch einmal das antike Hellas wiederentdeckt hatte, was seinen Ausdruck z.B. in der Wiederaufnahme der antiken olympischen Spiele fand. wandert ihren goldenen Weg - senkt sich still ins Meer.